Just hours after Freddie Gray’s funeral, protesters clashed with police stationed near Mondawmin Mall in northwest Baltimore. 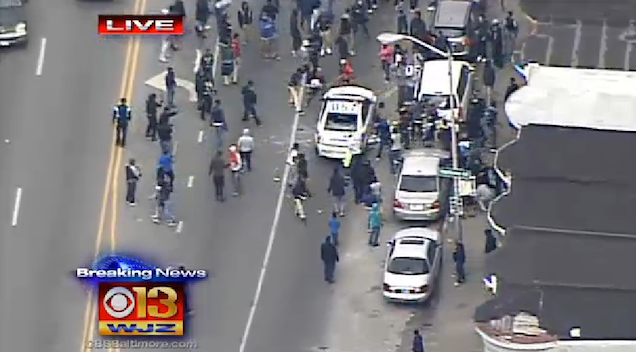 At least seven officers have been injured, according to police, and there are reports of several arrests. One of the officers is reportedly unresponsive. Early reports indicate many of the protestors are high school students who gathered at the mall as part of a demonstration organized on social media. Reporters for CBS Baltimore and the Baltimore Sun report that rocks and bricks were thrown at police, who responded with pepper spray. You can watch a livestream of the demonstrations here. Many businesses and schools throughout the city have closed early, and there are reports of looting at a CVS. As the protests move south, police have set up barricades in front of City Hall and police headquarters. UPDATE 8:23 pm: The Washington Post reports that a police official says 15 officers were injured and two were hospitalized during the day’s protests. At least 27 people have reportedly been arrested so far. A curfew will also be imposed between 10 pm and 6 pm, which Rawlings-Blake says will last for a week at least. UPDATE 7:22 pm: Maryland governor Larry Hogan has declared a state of emergency in Baltimore, enabling him to activate the National Guard. UPDATE 6:40 pm: The CVS is now on fire. UPDATE 5:40 pm: The gates at Camden Yards have been ordered locked for now, though no decision has been made about tonight’s Orioles game. 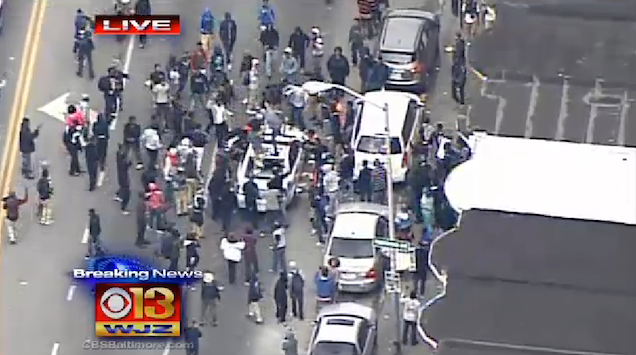 BREAKING: Attorney: Freddie Gray's family 'in shock' watching Baltimore violence, urges calm. 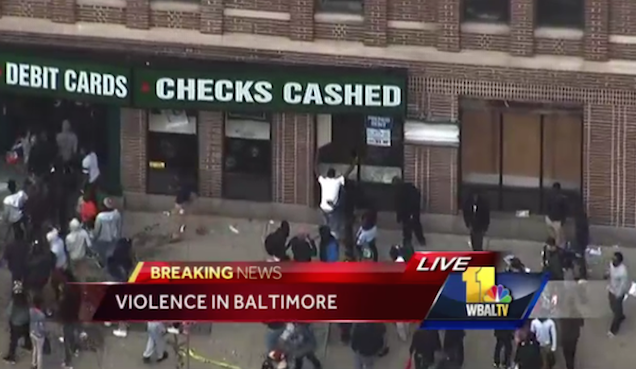 #Baltimore looters now vandalizing a check cashing business, breaking windows, carrying things out. CNN live now. A police car has been set on fire at North Avenue and Pennsylvania Avenue. A photographer was just assaulted. Horrible to watch. 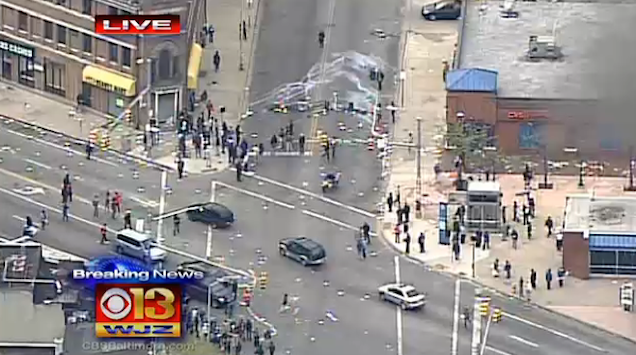 Officers still being pummeled with bricks, bottles.